You can get a free and non-binding offer by calling 020 3404 1646 or sending an online request here. Our customer care is at your service 24/7! The professional cleaner arrives in your kitchen equipped with all necessary equipment, tools and Prochem certified solutions. The oven is tested before the cleaning. If it works, the cleaner proceeds to disassemble it. All removal parts, such as: trays, racks, light protectors, knobs and others are removed and dipped in a tank with special degreasing and sanitising solution. The oven itself is cleaned thoroughly inside and out. Any burnt on carbon and other residue is scrubbed off with wired brushes and special solutions. After that, the removable parts are also scrubbed to perfection. Everything is rinsed off, dried and assembled back together. After that, the oven is tested once again. Our cleaners can even do some minor repairs and replacements on your oven, upon request. We can deep clean all kinds of ovens, including hotplates, double ovens, range ovens, cooktops, microwaves and barbeques. We can also deep clean your extractors, hobs, refrigerator, freezers, dishwashing machines, washing machines, warming drawers, and more. Even more, we can perform a full deep kitchen cleaning for you and professionally clean and scrub your tiles and grout, the ductwork, your splashbacks and everything else in your private or commercial kitchen. Make sure your oven cooks faster, uses less energy, cooks tastier and healthier by booking our professional deep oven cleaning service. RDA Cleaning & Maintenance Ltd. has been faithfully serving our private and business customers in London since 2008. We offer a wide variety of professional cleaning and maintenance services, and deep oven cleaning is one of the specialised services, which is best known among our customers residing in the area. All of our cleaners are experienced and properly equipped to clean just about any kind of oven and other kitchen appliance for you. We have created detailed cleaning checklists which are closely followed by our cleaners, as well as safety and quality operating procedures. 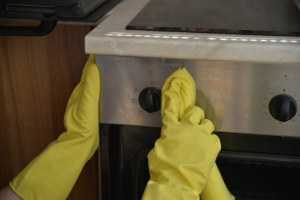 All of our cleaning services are fully insured and at affordable oven cleaning prices. Get in contact with our 24/7 customer care service now. You can call 020 3404 1646 or send us an online request here. Your booking confirmation will come via SMS and e-mail within 2 hours of your request. There is no deposit for booking and no hidden fees for our services. Our price is fixed. You can get a discount by ordering several of our cleaning or maintenance services simultaneously. You will receive preferential prices if you: book early, are a regular customer, are a landlord or estate agency. We have emergency, same day cleaning. We are available or weekends and bank holidays. Our oven cleaning is safe, so you can use the oven or other kitchen appliance right after the procedure! Book now!